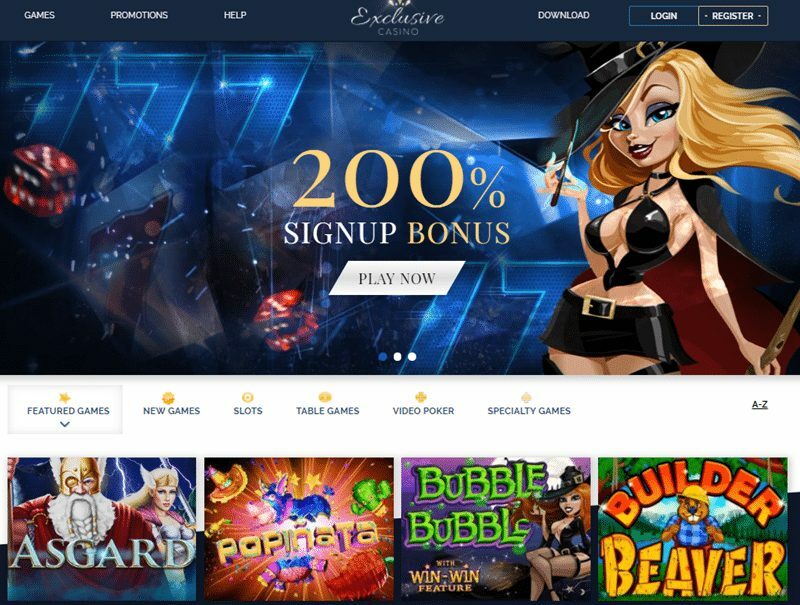 Exclusive Casino no Deposit Bonus Codes 2019 - Get up to $2000 NOW ! Exclusive Casino is home to a wide array of virtual games, offering members hours of entertaining fun and excitement along with the promise of big wins. Numerous bonuses and large, progressive jackpots are available, creating a royal experience that features state-of-the-art game play with superior speed and sleek graphics for all players. In fact, the glittery appearance of the home page seems to promise glorious fun for anyone who joins this gambling venue, which is easy to navigate. This online casino provides the convenience of being offered in three languages, including French, Italian, and English, and it has a user-friendly customer service system that makes it possible to find the answers you need quickly and simply. Territories Restrict: Belarus, Bulgaria, Albania, Czech Republic, Georgia, Bosnia and Herzegovina, Estonia, Kyrgyzstan, Indonesia, Mongolia, Kazakhstan, Montenegro, Latvia, Russia, Lithuania, Romania, Uzbekistan, Poland, Ukraine, Serbia, Thailand, Slovakia, Turkmenistan, Tajikistan, Slovenia,and Tadzhikistan. Exclusive Casino play now ! The incredibly sleek graphics and entertaining game play featured by Exclusive Casino is delivered through the RealTime Gaming platform. As a result, players have access to top-of-the-line software offering the option to download games onto personal computers as well as the option to access immediate game play. Real Time Gaming is a well-known entity with a reputation for delivering honest, fair gaming for online casinos. The instant-play feature requires Adobe Flash technology, so this software should be installed prior to attempting to play one of the games in this mode. No matter which method of play is chosen, the level of fun is highly entertaining. Exclusive Casino is one of many online casinos licensed through the government of Curacao, an island in the Caribbean. This government is also responsible for regulating the casino's operations. A bit of everything can be found at Exclusive Casino from table games to slots with numerous video poker selections, table games, and slots. An exceptional array of table games features roulette, multiplayer roulette, blackjack, baccarat, craps, poker, and rummy, giving players enough of a variety that they might never become bored at this online casino. In addition to popular slots such as Monster Mayhem and Bulls and Bears, players can enjoy one of the constantly expanding collection of Reel Games that feature enticing bonuses. Players can also experience the thrill of multi-hand and single-hand poker games in a growning variety ranging from Pick ‘Em Poker to Jacks or Better games. A welcome bonus up to €3,000 is available to players who choose to take advantage of it during their first three deposits. This is a generous bonus for new members playing virtual games on Exclusive Casino. Fans of table games can also access a welcome bonus up to €500 as long as their initial stake is placed for a game using a deck of cards. Comp points are given to members as well, allowing them to earn a little extra on their deposits. As with most online casinos, a number of territories and countries do not allow their residents to join Exclusive Casino. If your location is one of them, you cannot sign up to play. Additional restrictions are in place regarding bonuses for the following locales: Belarus, Bulgaria, Albania, Czech Republic, Georgia, Bosnia and Herzegovina, Estonia, Kyrgyzstan, Indonesia, Mongolia, Kazakhstan, Montenegro, Latvia, Russia, Lithuania, Romania, Uzbekistan, Poland, Ukraine, Serbia, Thailand, Slovakia, Turkmenistan, Tajikistan, Slovenia,and Tadzhikistan. Security is a top priority for Exclusive Casino, which is why it secures its website using SSL encryption technology. All sensitive data is hidden from unwanted intrusion, keeping deposit and withdrawal transactions secure at all times. Third-party auditors from a reliable mathematics testing agency, TST, check the software on a regular basis in an effort to validate its fairness for all manner of play. Unfortunately, members cannot use credit cards to withdraw funds. However, they can request a bank wire transfer or check. Neteller and Skrill can also be used to withdraw funds form Exclusive Casino. Deposits can be placed using Visa, MasterCard, CLICK2PAY, Skrill, instadebit, and Neteller. Although most problems players experience are minor, answers are readily obtained on a 24-hour basis. Exclusive Casino offers live chat, a toll-free phone number, and email access to get the answers needed to all sorts of questions. This is truly one online casino that appreciates the need to provide continual support for its members.